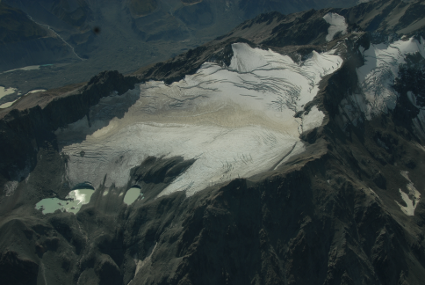 Since 1978 an aerial photographic survey of the glaciers of New Zealand has been carried by Dr Trevor Chinn. The primary purpose of the survey is to record how much snow covers the glaciers at the end of summer. This information may be used to indicate whether the previous year’s weather would lead to an increase or decrease in glacier size. These surveys have led to the greatest regional glacier photographic collection in the world. Reports have been prepared following many of the surveys, most of which are available below. Currently the programme is managed by NIWA under the guidance of Dr Trevor Chinn. It is anticipated that the photographic record will be digitised and made available to the public, with access via this website. Until that time, data inquiries may be made to Dr Adrew Lorrey (andrew.lorrey@niwa.co.nz), the project manager of NIWA’s “Climate Present and Past” research programme. Willsman, A.P., Chinn, T., Lorrey, A., 2013. New Zealand glacier monitoring: end of summer snowline survey 2012. CHC2013-013 CHC2013-013. Willsman, A.P., Chinn, T., Lorrey, A., 2012. New Zealand glacier monitoring: end of summer snowline survey 2011. CHC2012-052 CHC2012-052. Willsman, A.P., Chinn, T., Hendrikx, J., Lorrey, A., 2010. New Zealand glacier monitoring: end of summer snowline survey 2010. CVAS111 CHC2010-113, i, 132 p. : 10 figs, 54 photos, tables, refs p. 224–25. Willsman, A., Chinn, T.J., Hendrikx, J., Lorrey, A., 2009. Glacier Snowline Survey 2009 (No. AKL2008-71), NIWA Client report: CHC2009-152. NIWA, Christchurch. Willsman, A., Salinger, J.M., Chinn, T.J., 2008. Glacier Snowline Survey 2008 (No. AKL2008-71). NIWA, Auckland. Willsman, A., Salinger, M.J.., Chinn, T.J., 2007. Glacier Snowline Survey 2007 (No. AKL2007-72). NIWA, Auckland. Chinn, T.J., Willsman, A., Salinger, J.M., 2005. Glacier snowline survey 2005 (No. AKL2005-083). NIWA, Auckland. Chinn, T.J., Salinger, J., Heydenrych, C., 2004. Glacier snowline survey 2004. ACCV033 AKL2004-141. Chinn, T.J., Heydenrych, C., Salinger, J., 2003. Glacier snowline survey, 2002. CVB023 akl2003/23. Chinn, T.J., Salinger, M.J., 2001. New Zealand glacier snowline survey. NIWA Technical Report 98. Chinn, T.J., Salinger, M.J., 1999. New Zealand glacier snowline survey, 1999 (New Zealand Publication), NIWA Technical Report 68. Chinn, T., 1998. Glacier Snowline Survey , 1998. Institute of Geological & Nuclear Sciences, Lower Hutt. Chinn, T., 1997. Glacier Snowline Survey , 1997, Institute of Geological & Nuclear Sciences science report ; 97/18. Institute of Geological & Nuclear Sciences, Lower Hutt. Chinn, T., 1996b. Glacier Snowline Survey , 1995, Institute of Geological & Nuclear Sciences science report ; 96/5. Institute of Geological & Nuclear Sciences, Lower Hutt. Chinn, T., 1993. Field report – 1993 glacier snowline survey. Dunedin. Chinn, T., 1992. New Zealand glacial snowline fluctuations report of the survey of Autumn 1992. Institute of Geological & Nuclear Sciences.